Ukrainian news sites report that on her third day after returning to Ukraine from illegal imprisonment in Putin’s Russia, Nadiya Savchenko visited the cemetery where some of her friends killed in combat defending Ukraine from the Russian aggression are laid to rest. Later in the day she had a meeting with President Poroshenko. Savchenko’s sister Vira posted a short post with several photographs from the cemetery visit. In it she said: “We came to our friends. And it started to rain … The heavens are crying. Nadiya asked me whether I have a feeling that they all are standing [around us]..? 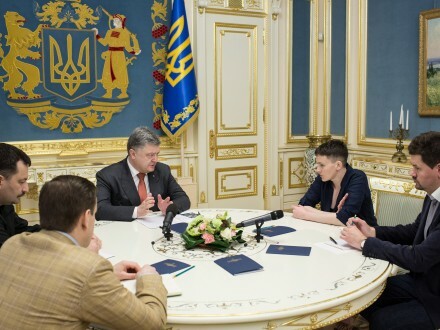 Later in the day she met with the President of Ukraine Petro Poroshenko. Poroshenko conveyed to her warm greetings from US Vice President Joseph Biden and the President of the European Parliament Martin Schultz. He emphasized that public activism in the United States and European countries demanding to liberate the Ukrainian political prisoner had a significant impact on attaining her freedom. They also discussed the Savchenko-Sentsov List for sanctions and coordinated joint actions to accelerate the release of other Ukrainian prisoners. Interestingly, President Poroshenko also “coordinated with N. Savchenko the perspectives of presenting of Ukrainian position” in the Parliamentary Assembly of the Council of Europe in the European Parliament. It will the first assembly that Savchenko will be attending since she became an elected PACE deputy while in Russian prison. The president proposed to Nadiya that she visit several European countries and meet with their leaders. They concluded their meeting by discussing the situation on the frontline with Russian hybrid forces, the increase in Russian artillery attacks and the death of Andriy Zhuk, the battalion commander of the 72nd Brigade.